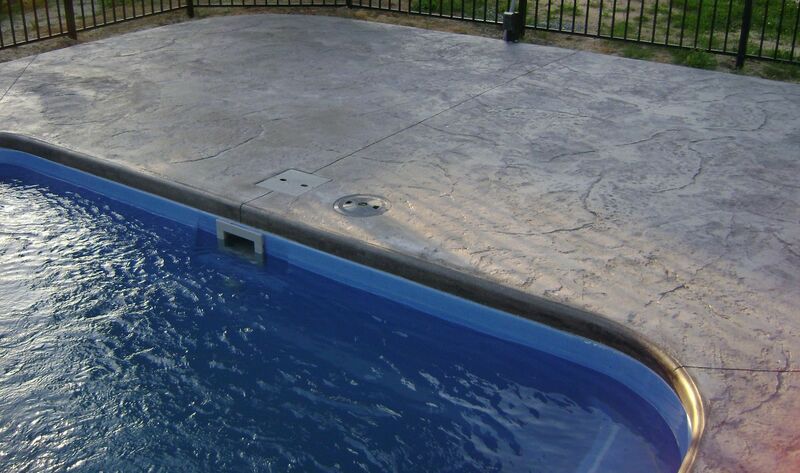 So which is the better swimming pool patio material: pavers or stamped concrete? That's currently the debate in the pool patio world. Both are durable, relatively affordable, and look great. That's probably why consumers find them the two most popular options on the market today. Let's discuss the pros and cons of each so you can decide for yourself. Should I get stamped concrete or pavers for my pool patio? Stamped concrete typically costs $12–$16 per square foot. Many patterns and colors are available, but it can be slippery, and concrete will crack. 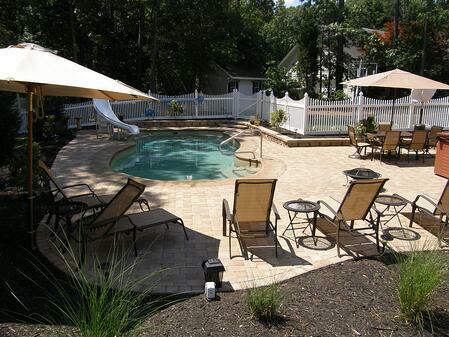 Pavers typically cost $16–$24 per square foot. You can easily repair and add to the patio in the future, but weeds can grow up between pavers. You have a wide variety of colors to choose from. Stamped concrete is often composed of at least two colors. A base color is mixed in the concrete or troweled into the surface. A second color called a release agent is broadcasted on top of the concrete just before stamping. The relationship of these two colors is what gives stamped concrete its unique antiqued look. Stamped concrete is sealed. This protects it from the elements as well as pool chemicals like salt from salt water systems. It's concrete so it will crack. No one will steal it without you knowing about it. The contractor's job is to place control joints to cause the concrete to crack where they want it to...but sometimes concrete cracks where it wants to. The only way to guarantee no crack is to get no concrete! If more than one truck load of concrete is required, there is no guarantee that the colors of the two trucks will match perfectly. They won't crack if installed correctly. You can easily add to the patio in the future. If they need underground repairs, a seamless fix is possible. They're not slippery unless sealed, which is seldom done around pools. There's a possibility that they will settle and move over time if not installed correctly. Weeds can grow up between pavers unless you use polymeric sand—sand with a polymer additive that causes it to bind together between the pavers and harden. It does prevent weeds but needs to be re-applied every couple years. You have more limited color and pattern selections. There can be unwanted variation in color of the product, even between different pallets of material from the same truck. So what say you? Which do you prefer? Asking me if I prefer stamped concrete or pavers is like asking me if I would rather have a porter house or rib eye steak...the answer is yes. But seriously, there are situations that call for both. Whether you plan to expand the patio in the future. One thing's for sure—with the durability and beauty of both of these patio materials, it's hard to go wrong. Editor's note: This article was updated on February 1, 2019.